Inclusion starts from home, in building an inclusive society. It’s important to advocate populations with respect to its diversity and their needs. But, of course the educational institutions are the best and the obvious target audience for this kind of activities. It’s equally important to asses these programs on a schedule. Thereby to advocate for an action plan in response to the identified needs regarding equity and inclusivity. 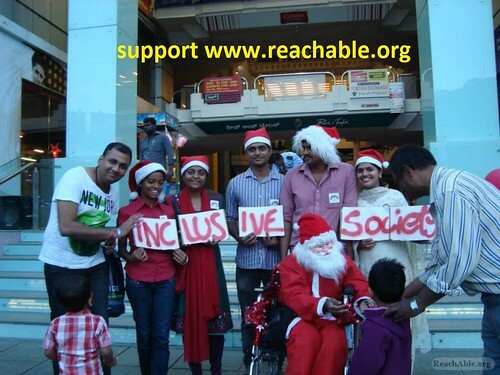 This is the place where ReachAble sets a benchmark on how effectively an organization can change the attitude of a community through a different level approach of awareness. There are NGOs (If you count on them, it’s in thousands) who provides wheel chairs, cane sticks or walkers. But it’s doubtful that, they had a realization of the importance of an inclusive society in their mind. And if it’s so, it’s obvious to come to a conclusion that, they are beating around the bushes. It’s not about sorting out something but, would like to live like a man!